Holly Bloom wants to be a great gardener but she doesn’t seem to have the knack. Despite suggestions and support from her mom Iris, and her siblings Bud and Rose – all great flower-growers – Holly just can’t seem to get her garden to bloom. She tries water and fertilizer, uses all the right tools, even paints her thumb green, but her daisies keep drooping. Through trial-and-error and with great perseverance, Holly finally realizes that she does not need to grow flowers with soil and seeds. Inspired by her artistic father, she taps into her natural creative abilities and surprises everyone by “growing” her own unique flowers from paper and paste, pipe cleaners and paint, and best of all, these flowers are made especially by Holly Bloom. This charming book uses playful language to teach plenty about gardening, but more about the joy of being yourself and finding your own true talents – even if that makes you a late bloomer. PreS-Gr 2-Holly Bloom is called “Sweetpea” by her mom and “Ladybug” by her dad. She longs to grow flowers like those of her mother, Iris, and siblings, Rosie and Bud, but she doesn’t seem to have the knack. Everything she plants either wilts or droops. Finally, in a burst of inspiration, she creates a glorious garden out of tissue paper, crepe paper, and pipe cleaners that is “guaranteed to last forever.” This is a satisfying resolution to a story of perseverance and self-discovery. However, the writing style is a bit precious, and the characters’ overly cute names detract from the tale’s merit. Lush, detailed drawings in pencil and acrylics fill the pages with sunny cheer. Holly feels like a misfit; she’s “as grouchy as the thorns on a rosebush.” Her mother, sister, and brother all grow beautiful flowers, but all of Holly’s attempts at gardening flop—literally. Her family tries to help, but nothing seems to work. After her dad, an artist, gently reminds her that there are many different kinds of tools to help a garden grow, Holly has an idea. In her own way she grows a beautiful garden, full of color and life, a garden that will last forever. The authors have fun with language throughout the book, using, for example, various plant names for the characters. There is Holly’s sister Rosie, her brother Bud, and her mother Iris; her mother’s nickname for her is Sweetpea. Interestingly, it is her non-gardening father, Harold, who uses the only other non-botanical name in the book—he calls Holly “Ladybug.” The authors play with alliteration—”her dahlias drooped before she even had dessert” —without overdoing it. The illustrator has created lovely pictures with a slightly old-fashioned flavor, using acrylic paints with black pencil outlines…the warmth and love in the family interactions shine through. This is a sweet story about a young girl who persists despite multiple failures, finally finding her own unique way to shine. A common enough theme in children’s literature, it is used here without a heavy hand, creating a book that is pleasing to the ear, eye, and mind. PreS-Gr. 2. Holly Bloom comes from a gardening family, but she seems to have a brown thumb. Her mother tells her that some flowers, like some people, are late bloomers, but no matter how hard Holly tries, she still manages to sneeze away the fertilizer and over-water the plants. Finally, Holly sees a way to grow flowers that plays to her strengths: shutting herself in her father’s art studio, she makes brilliant paper flowers that fill up the room. The ink-and-watercolor pictures are light and colorful, with, of course, a profusion of flowers filling the pages. A particularly pleasing picture framed in berries and leaves features Holly trying to paint her thumb green. Simply plotted and with a worthwhile message (though a bit overstated), the story will resonate with children who may have problems standing out in a family or who haven’t found the activity they shine at yet. Holly Bloom’s Garden, full of vibrant illustrations, will inspire children to create their own gardens in their own way. This is a charming tale of a late bloomer who struggles to discover her talents. It’s perfect for budding young gardeners and artists or any child exploring his or her own unique gifts. Slightly older readers will relate to Holly Bloom’s wish to do something as well as her mom and older siblings can. What does Holly want? To grow her own garden. Alas, her family’s flowers flourish, but Holly’s seedlings simply won’t grow. Not willing to give up, Holly keeps trying – until she finally figures out how to have a perfect garden of her own. Gentle illustrations in colored pencil and acrylic paint evoke Holly’s struggle and celebrate her unique solution. (Watch for a chicken in Holly’s garden, too!) Young readers facing a difficult goal will be encouraged to think outside the box, just like Holly Bloom. Perfect for the child struggling to find his or her own talent. …a picture storybook for young readers about Holly’s horticultural learning curve. A child’s love of gardening begins with a partnership between youngster and adult. Eventually it becomes a relationship between youngster and nature. Gardening presented as a fun experience is the best way to cement that relationship. The following children’s books are excellent avenues to hours of entertainment and a lifetime of knowledge…. Colorfully illustrated tale of young Holly, cursed with a gardening black thumb. Desperate, she paints her thumb green, but her dahlias still droop. After repeated attempts to keep plants alive, some advice from dad sets up a surprise and happy ending. Holly Bloom has a problem. Everyone in her family has a green thumb, except for her. Her mother Iris is a skilled gardener under whose hand beautiful flowers unfold. Her sister Rosie grows flowers that are famous the whole town around. Even her brother, Bud, has a green thumb. Each in turn tries to help Holly plant and grow some flowers, but to no avail. Holly even takes the drastic step of painting her thumb green, but even this does not make her flowers grow. Rather than growing depressed, or giving up, Holly keeps trying. She waters, and fertilizes, and is careful to use the right tools, but nothing works. Still determined to succeed, Holly keeps trying new methods of making her flowers grow. She never gives up and, inspired by her father, at last finds a solution to her dilemma by creating her own unique flower garden out of tissue paper, crepe paper, pipe cleaners, paste, sparkles, and paint! Written by Sarah Ashman & Nancy Parent, and lushly illustrated by Lori Mitchell, Holly Bloom’s Garden is an enchanting story about creativity and perseverance. It is also a story that teaches children to embrace their differences and to build upon their own talents. The text is printed in a large print font that will prove a boon to both young and old eyes. In addition, the story is brought vividly to life via the cheerful color illustrations and black and white sketches that accompany the story. Holly Bloom’s Garden is an enjoyable story that is a perfect book for reading out loud, and it will enthrall young readers as they discover how Holly makes her garden bloom! Holly Bloom really wants to have a great garden. But she doesn’t seem to have the knack, even after helpful hints from her green-thumbed mom and siblings. Her daffodils don’t grow and her daisies keep drooping no matter what fertilizer she uses! Then she asks her father what to do, and is inspired by him to create a wonderful garden. How does she do it? Read this story to find out. For kindergarten through grade two. The dust-jacketed hardcover Holly Bloom’s Garden is a perfectly pint-sized story about perseverance, ingenuity, and creativity set in a modern home. Holly’s mom and brother and sister can all grow flowers but, no matter what she tries, Holly’s flowers are a continual flop. Then, Holly takes a cue from her artist-dad, adds some sparkle of her own, and creates her own, one-of-a-kind garden. What surprise awaits her family? Will this garden last? The artwork is exceptional and quite detailed in this colorful picture book, and, therefore, the book could be used to teach your younger learners about plants, gardening, and flowers. Holly comes from a family of green thumbs. Her mother, her sister, and her brother all have the touch; they have all grown beautiful blooming gardens of flowers. For some reason though poor Holly cannot seem to make anything grow in her plot. Flowers she plants soon wilt, droop, and give up. It is a very frustrating and distressing situation for the girl but she doesn’t give up. Holly tries all sorts of things to try to make her flowers flourish, including painting her thumb green. She fertilizes, waters, tries using the “right tools”, plants and plants some more. All to no avail. Then Holly has a burst of inspiration and she sets about creating a garden that is all her own, the kind of the garden that is suited to Holly Bloom. We all would like to have certain skills and gifts but sometimes that just doesn’t come naturally no matter how hard we try. Holly’s inspired and unique approach to having a garden of her own shows us how we can use our creativity to attain our dreams, and also how we sometimes need to gracefully accept that we cannot be good at everything. It is just a matter of finding our own unique, individual, talents. Beautifully illustrated with a simple text and a warm message, this picture book is a real treasure. Sometimes I am amazed by how many “you can do anything you set your mind to” books exist, when as adults we know that you can’t really do anything you set your mind to. Some people are just better at some things. Holly Bloom’s Garden explores this theme with a nice nod to reality. Holly really isn’t as good at gardening as the rest of her family — but that doesn’t mean she can’t use what she is good at and find her own success. The text of the book is lively, despite the gardening theme. My 4-year-old daughter, who has zero interest in gardening, had to be dragged to the reading room for this story, but once she heard it, she asked for it again and again. It definitely speaks to children who sometimes feel a bit unsuccessful. And it’s a smooth read aloud without any of the accidental tongue twisters you sometimes find in picture books. The illustrations are detailed and lovely. Lori Mitchell has created a Holly who is appealing and totally real. In some ways, the look lacks some of the flash of books by larger publishers, but it creates a warm and comforting place for young readers. Helping children to learn perseverance is probably one of the hardest but most important lessons in their young lives. 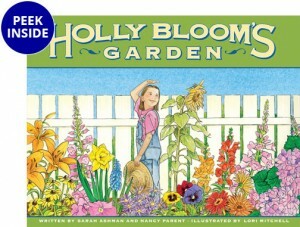 Holly Bloom’s Garden is a delightful story of a young girl and her determination to have a flower bed. Despite everything she tries, including painting her thumb green, digging the “perfect patch”, using fertilizer and dragging heavy watering cans, her efforts continue to fail. Walking through the beautiful and colorful garden her mother, sister and brother grew, she becomes saddened by her lack of success. Holly’s father, seeing her disappointment, comforts her and suggests that perhaps she just hasn’t found the right tools… That night, Holly triumphantly discovers the tools that give her the vibrant flower garden she has envisioned. Holly Bloom’s Garden is a wonderful book filled with beautiful illustrations, making it a great read and an ideal addition to a child’s collection. Try as she might, Holly couldn’t make her garden grow. Though her family are green-fingered, with blooming successes, Holly’s plants and flowers wilt and die and fail to thrive. Holly is not a girl to be discouraged, though, and though she’s disappointed, she looks for other ways to succeed. Holly finds a way to create her own blooms, without a single seed needing to be sown. This story of a very determined girl who won’t let the let-downs of life stand in her path is a sweet one, and will appeal to younger children of about four to seven years old. Lori Mitchell has illustrated Holly Bloom’s Garden with detail and colour, and I expect the book would be a favourite of little girls, though it could be read by boys as well. A pleasant book … an enjoyable and well-presented story. This is an absolutely glorious picture book about a family of gardeners all of whom have a green thumb except for Holly Bloom, the youngest child. She just can’t make her flowers blossom. How Holly learns how to blossom in her own way makes a wonderful story for young children. Sarah Ashman is co-author of Holly Bloom’s Garden with Nancy Parent, illustrated by Lori Mitchell. She worked for many years as a talent representative, specializing in comics and humor. 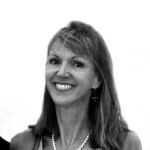 She was Vice President and Director of Comic Arts for United Feature Syndicate/Newspaper Enterprise Association where she successfully acquired and developed Scott Adam’s Dilbert and other comics for newspaper syndication. At UFS/NEA she also edited Charles Schulz’s Peanuts and Jim Davis’ Garfield among scores of others, and a biography of Charles Schulz called Good Grief. She also collaborated with Nancy Parent on Meditations for Toddlers Who Do Too Much. In addition, Sarah is the administrator of howardashman.com, a website celebrating the life and work of her late brother, lyricist and director Howard Ashman, famous for his work on Beauty and the Beast, Aladdin, The Little Mermaid, and more. Sarah lives in Tarrytown, New York. Nancy Parent is co-author with Sarah Ashman of Holly Bloom’s Garden, illustrated by Lori Mitchell. 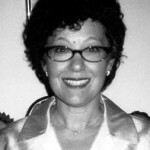 Nancy is a publishing professional who has written and developed several lines of books as well as extensive collateral materials for Disney Mouse Works. She is the author of over 75 children’s books. Nancy began her publishing career at Grosset and Dunlap, editing mass-market and trade children’s and YA paperbacks. She was the script supervisor and production coordinator on Disney’s The Little Mermaid and The Prince and the Pauper, and Senior Editor of Disney’s Mouse Works imprint from 1994-1998. She also collaborated with Sarah Ashman on Meditations for Toddlers Who Do Too Much. Nancy lives in Pasadena, California. 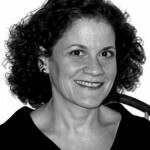 Lori Mitchell works as an editorial and advertising illustrator, and is the illustrator of Holly Bloom’s Garden, co-authored by Sarah Ashman and Nancy Parent. Her first children’s book was Different Just Like Me, which she wrote and illustrated. Lori appeared on Oprah! and The Today Show in connection with Different Just Like Me, which was highly acclaimed: American Booksellers Association Kids Pick of the Lists 1999, Read America! Collection 1999, Best Children’s Fiction, San Diego Book Awards 1999, Early Childhood News Directors’ Choice 2000, Notable Social Studies Trade Books for Young People for 2000, chosen as Best Children’s Book, San Diego Magazine Book Awards 2000, selected as Outstanding by the Parent Council, Fall, 199. Lori lives in San Diego, California. Error: Error validating access token: Session has expired on Sunday, 23-Sep-18 01:36:16 PDT. The current time is Friday, 26-Apr-19 01:04:13 PDT.